The vast archives of the Dorena Historical Society (okay, a cardboard box in my closet) contain many old Row River Valley School pictures. 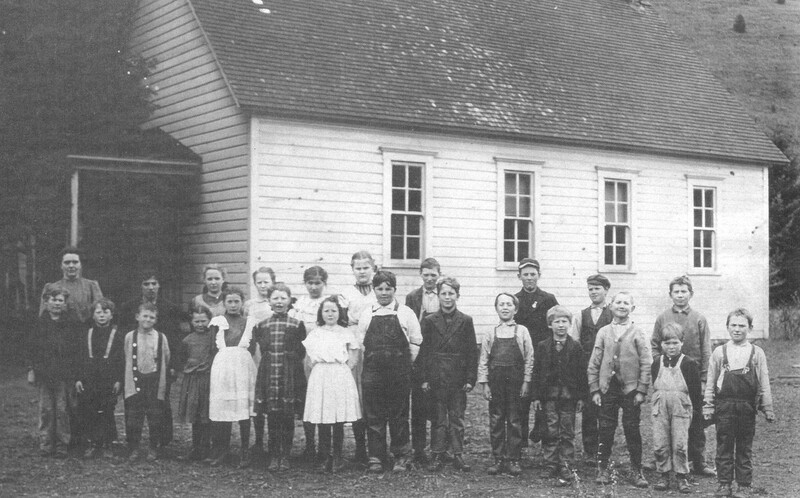 Here are some rough and tumble Culp Creek School kids. Looks like the 1940s based on the cool baggy blue jeans on the girls. Culp Creek School survives today as Childs Way Academy. The kiddies of Wildwood School were an impish group. The story goes that the teacher here wore a clock around his neck to tell him when class was over. The older kids convinced a little girl to sit on his lap and sneakily turn the minute hand ahead so that they could get out of school sooner. Unfortunately she turned the hand the wrong way and they had to suffer through extra class time. An old and wrinkled copy of a photo of the Disston School Student Body around 1914. This was the furthest school up the valley. The gym survives as an outbuilding on private property. Photos and the history of the Dorena School will be on another post. There was also a school at Star. There was a Doolittle School for a time up on Rat Creek. I’m pretty sure I see my mother Millicent Vaughn in the Culp Creek School photo circa “1940s”, second row, second from the right. You are probably correct! The picture came from Marie Owens Raymond who is on the bottom right.